Expandable, highly mobile small business system. Fully integrated digital answering system. Designed with mobility in mind, this expandable corded/cordless system offers a powerful communications solution for small businesses. 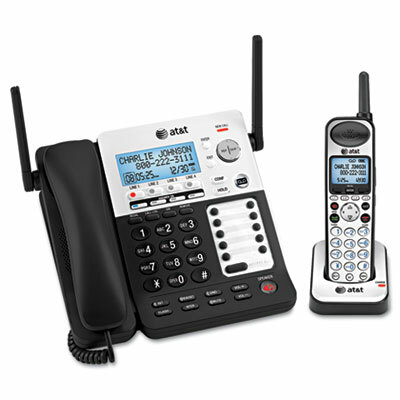 Fully integrated digital answering system provides each extension with its own voicemail and includes professional-quality features, such as voice prompts and music on hold. Mobile employees have access to push-to-talk intercom, paging, call transfer and three-way conferencing from cordless handsets. System range can be extended to up to half a mile with the addition of repeater accessories (sold separately). Compatible with most headsets (via 2.5mm jack) and hearing aids.